All Frontload parts washers, and Top Load parts washers require welding. This welding process can take up to 3 Days depending upon the size of the machine, and the required parts washer options. 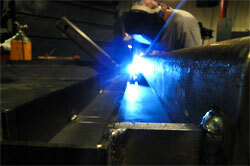 Welds are checked by dye penetrant inspection which is used to locate surface breaking defects. This testing method is based upon capillary action, where low surface tension fluid penetrates into clean and dry surface breaking discontinuities. After adequate penetration time has been allowed, the excess penetrant is removed, and a developer is applied. The developer helps to draw penetrant out of the flaw where a visible indication becomes visible to the inspector.